Lee had failed at Gettysburg. The battle was costly for the Confederacy, and it was celebrated across the North. Another major Union victory came directly on its heels. Farther to the west, General Ulysses S. Grant had surrounded the Mississippi River town of Vicksburg, one of the last Rebel holdouts on the great river. For six weeks, Grant had bottled up its citizens, plus a Confederate force of 20,000, and nearly starved out the population. Then, on July 4, the day after Meade's victory at Gettysburg, General John C. Pemberton surrendered his forces and Vicksburg fell into Northern hands. Complete Union control of the Mississippi River soon became reality. January 1, 1863. 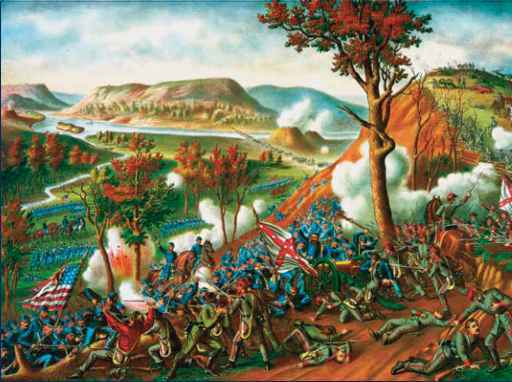 The fight took place between 44,000 Union troops and 35,000 Rebels at Murfreesboro, Tennessee (remembered also as the Battle of Stones River). It resulted in Bragg's defeat, but he withdrew his forces to fight another day. Both armies slipped into winter quarters following the fight at Murfreesboro. With the arrival of spring, Rosecrans received orders from Washington to begin moving against the enemy. Although his army numbered 75,000 by then, he refused to move. In George McClellan fashion, he instead demanded more men, supplies, and horses. In the meantime, Bragg and his 40,000 men watched the Union Army closely. By June, Rosecrans was ready to fight. The two armies jabbed at each other for several days from late June to early July. Rosecrans forced Bragg to abandon his base at Tulla-homa, Tennessee, and retreat to Chattanooga, on the border between West Tennessee and Georgia. They were reinforced there by an additional 20,000-man army. By mid-August, Rosecrans was on the march toward Chattanooga. Over the following three weeks, he had crossed his entire army over the Tennessee River, forcing Bragg and his small force to abandon Chattanooga. As Bragg's army retreated southward, Rosecrans attacked on September 9, sending three corps against the enemy. However, his three units marched so far apart that 40 miles (64 km) of the rugged Tennessee Mountains eventually separated them. Believing he had Bragg on the run, Rosecrans pushed his men forward. Bragg then took the offensive on September 10, knowing that Rosecrans's armies were greatly separated. The assault against Union major general George Thomas's corps was unsuccessful. Two days later, Bragg attacked again, this time against Major General Thomas Crittenden. Again, the Confederate attack failed. September 18, 7,000 of Longstreet's men had reached Bragg's army, in time to participate in the Battle of Chickamauga. When the battle opened on the morning of September 19, General Thomas, who thought he was sending his men against a Confederate infantry brigade, discovered too late that the enemy was actually cavalry forces under General Nathan Bedford Forrest. The battle lines spread out quickly, and by mid-afternoon, the fight was on along the entire length of the Federal line. The day was a seesaw of action, as neither side gained an ultimate break along the 6 miles (10 km) of the front. That evening, General Longstreet himself arrived. He and Bragg divided their forces into two wings, with Longstreet taking command of the left flank. As fighting opened the following day, General Rosecrans made a great mistake when he moved forces along the line to fill a gap he thought was along his left flank. By doing so, he created a large gap along his right flank. At 11:00 a.m., the battle not yet two hours old, Longstreet saw Rosecrans's error and poured 11,000 men in the breach, causing Rosecrans's right flank to fall apart. General George Thomas was only able to drive back the Rebels because Bragg did not follow up on Longstreet's move. Thomas's efforts gained him the nickname of the "Rock of Chickamauga." He organized an orderly retreat, saving Rosecrans's army. After the Battle of Gettysburg, Union forces gained more ground following several hard-won victories in other Southern states. 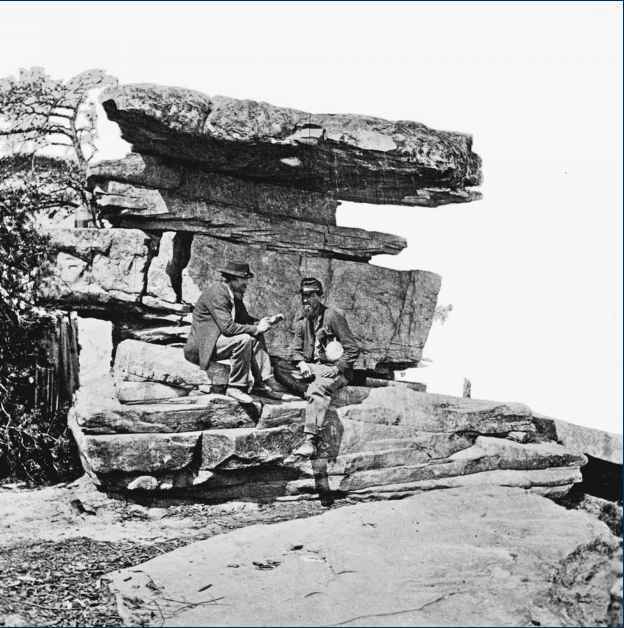 In Tennessee, for example, Union general William S. Rosencrans unwisely gave up Lookout Mountain (above) to the Confederates, a mistake that gave General Ulysses S. Grant command of Union soldiers. crosses Walden's Ridge through Anderson's Crossroads and into nearby Bridgeport—but Confederates harassed this route constantly. Also, when heavy rains set in, the ground was miserable to cross. Food became so scarce for Rosecrans's army that thousands of Union horses were killed and eaten.